The figure also indicates that real debt burdens are higher than many households expected prior to the crisis. Look at the dashed line. It shows the average expected dollar income growth rate over the 'Great Moderation' period was 5.3%. Now imagine it is early-to-mid 2000s and you are taking out a 30-year mortgage and determining how much debt you handle. An important factor in this calculation is your expected income growth over the next 30 years. If you were average, then according to this data you would be forecasting about 5% growth rate. But that did not happened. 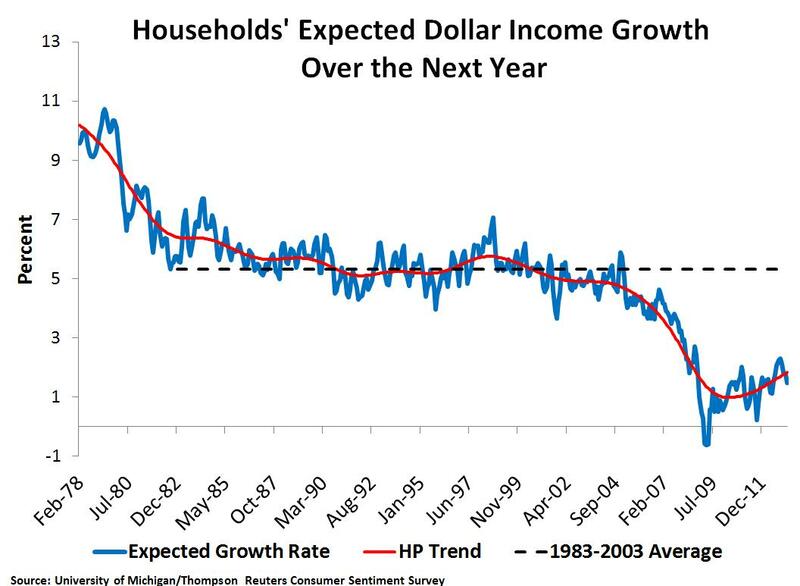 Household dollar incomes declined and are expected to remain low. Nominal debt, however, has not adjusted as quickly leaving higher than expected real debt burdens for households. 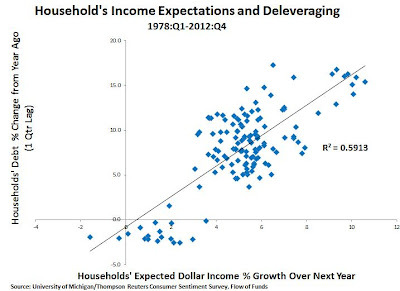 This figure suggests that for households, expected dollar income growth matters a lot for deleveraging. It also implies "balance sheet recessions" are a byproduct of nominal income shortfalls. One policy implication, then, is that the Fed should have maintained aggregate nominal income growth at its expected path. It failed to do so in 2008 and has yet to fully make up for this shortfall. Financial markets are incomplete, thus for many agents borrowing is possible only by accepting a financial contract that specifies a fixed repayment. However, the future income that will repay this debt is uncertain, so risk can be inefficiently distributed. This paper argues that a monetary policy of nominal GDP targeting can improve the functioning of incomplete financial markets when incomplete contracts are written in terms of money. By insulating agents' nominal incomes from aggregate real shocks, this policy effectively completes the market by stabilizing the ratio of debt to income. The paper argues that the objective of nominal GDP should receive substantial weight even in an environment with other frictions that have been used to justify a policy of strict inflation targeting. Fed officials should take note. So should ECB officials since this finding is particularly poignant for the Eurozone. It is time to fully embrace NGDP level targeting. Wherever we go we hear about the 'healthy properties' of NGDPLT. I hope the 'doctors of the world' - the central bankers - soon start to administer this wonderful 'vitamin'. It appears Japan has taken the lead, and that Bernanke, despite being a 'first mover' lost the lead! Those graphs , and those in your previous post , illustrate the problem nicely , so I'm surprised at how badly you've misinterpreted them. The best fit line on your second graph above shows that at an expected 6% income growth , debt grows at ~9%. At 10% expected income growth , debt grows about 15%. So debt , on average , appears to be taken on at about 1.5 times the rate that would be justified by income growth. Since actual nominal income growth has pretty well matched expected income growth over the period , it's no surprise that debt levels grew to an unsustainable level relative to incomes , with deleveraging an inevitable outcome. NGDP targeting will do nothing to change this pattern absent policies that ensure that NGDP gains are more broadly shared. We've seen it both ways since WWII , and we know what works and what doesn't. "It is important to stress that the policy implications of the model in recessions are matched by equal and opposite prescriptions during an expansion. Thus, it is not just that optimal monetary policy tolerates higher inflation in a recession , it also requires lower inflation or even deflation during a period of high growth." I haven't read the whole paper , but I wonder if he broaches the problem of having decent growth ( i.e. not a "boom" ) with low-to-moderate inflation yet with continuous growth in leverage , as we had in much of the 30 years leading up to the crash. Take another look at your graphs before you write that next paper. You're missed the point of the post: the deleveraging of recent years is more closely tied to drop in expected nominal income than the damage done to household balance sheets. Look at the change in HH net worth (as a proxy for HH balance sheets) and HH deleveraging over the past few years and former does a poor job explaining the latter after 2009. Changes in expected income does far better. This post is not about long-run debt accumulation and trying to use the above figure by itself is inconclusive for it ignores expected changes in wealth and sheds no light on household's discounted present values of future incomes. We only need to look to the period of the so-called Great Moderation , when both actual nominal gdp growth as well as expected nominal income growth were stabilized , as desired , to show that this claim has no basis in the historical data. Aggregate debt/income rose throughout. Of course , there was one group that realised the desired effect - the top 5%. Funny how economics always works out that way , aint't it ? 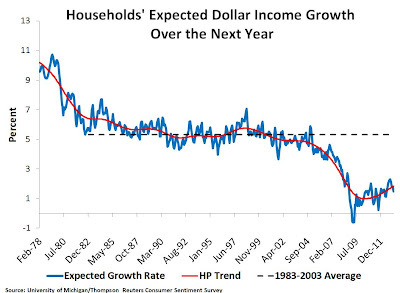 I'm eyeballing a FRED chart, but it seems the past 3yr rate of growth in Personal Income has been about 4%. 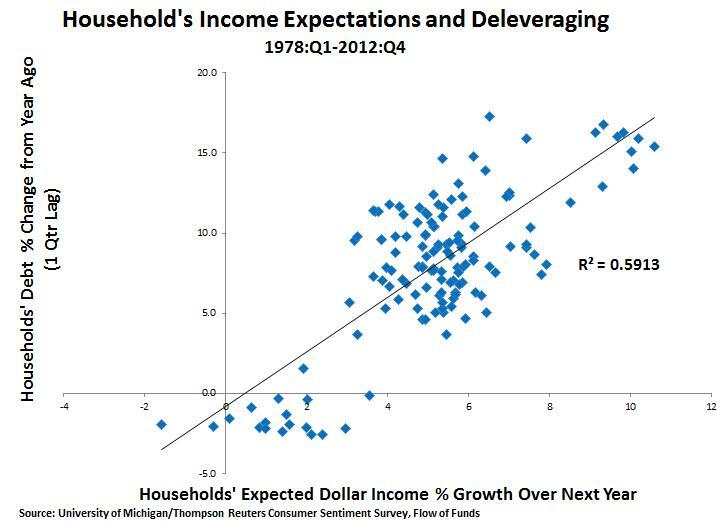 How could the UofM respondents have been so wrong in their income expectations? It seems bad forecasting, rather than an NGDP shortfall, is the source of any delevering. In other words, according to your chart, the past three years should have produced annual credit expansion of 5-10%; that is, if households had correctly predicted PI. Or perhaps, as Anonymous suggests, the real problem flagged in the UofM responses is the unequal distribution of expected Personal Income growth. It is an interesting as to why HHs remain so pessimistic about future income growth even though their forecasts have been wrong for a few years. Note, though, that prior to the crash they were fairy close to actual personal income growth so these forecast errors are novel. Distributional issues are important, but even the median expected income has stayed depressed. Something else is going on. Just a guess, but my sense is when asked about "income", most responses hear, "after-tax wages and salaries excluding health benefits". Adjusting for this, perhaps they haven't been so wrong. If this is the case, it is a distributional issue: the top 5% likely garner the lion's share of investment income, and the bottom 5% the lion's share of transfers.